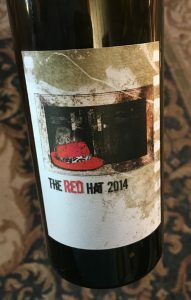 2014 Sheldon Wines “The Red Hat” Field Blend Napa Valley. The Sheldon’s brilliant and elegant red field blend The Red Hat is truly lovely stuff with graceful texture and layers of spice, earth and refined black fruits, this wine, a 60 case, 2.5 barrels, 12.8% cuvee of Cabernet Sauvignon and Petite Sirah is medium full with supple tannins and wonderful mouth feel. I was thrilled to find this in the cellar, drinking with family, especially after reviewing the up coming 2015 already, I guess I didn’t get to it earlier, which may have been a reward in it’s self as it is really showing well right now! This wine is from old vines, head trained in an almost feral site that is part of a holistic orchard in many ways with organic practices and many inter planting of other crops and trees, it’s co-picked and co-fermented with native yeasts and mostly whole berries and low sulphur, in a very natural way. The nose is perfumed with violets, acacia and peppercorns with light cassis notes leading to a polished palate of blackberry, tangy currants, plum and tart blueberry as well as pepper, black olives, minty anise, kirsch, savory tobacco leaf and subtle leather notes, lingering with mineral, lavender and briar/cedar notes. No new oak, only well seasoned casks allow remarkable purity to shine through, The Red Hat 2014 is a special wine that is getting better in the bottle, it is unique, a California wine first and foremost, but with an old world style with it’s lower alcohol and leaner structure, this micro winery’s hand-crafted small lot The Red Hat is in the same league as offerings from Wind Gap, Arnot-Roberts and Broc Cellars, all modern lighter fashioned wines by a new generation of inspiring winemakers. 2014 La Voix, Pinot Noir “Rebel Rebel” Quinta del Mar Vineyard, San Luis Obispo County. Steve Clifton’s solo project the La Voix Winery is his first gig since splitting with Brewer-Clifton, one of the Sta. Rita Hills top Pinot Noir and Chardonnay producers that he co-founded with Greg Brewer back in the mid 1990’s, and is showcasing his own path in winemaking with a set of small lot hand-crafted wines. I got up with Clifton at the Pebble Beach Food & Wine fest and got to taste through his latest releases both from his Italian inspired Palmina label and these beautiful and natural La Voix wines, which included a lovely Chardonnay, a Bordeaux blend from a high elevation site in the Santa Ynez Valley and this stylish Rebel Rebel Pinot Noir. The Rebel Rebel is named after David Bowie’s classic song, that was the first cover that a young rocker Steve Clifton recorded! Clifton was a musician and performer for years before he got into wine seriously and this Pinot Noir reflects this song (as a Rebel) in it’s character since it is the first wine he has made from outside Santa Barbara County as well as being a wine that is completely different to the Brewer-Clifton stuff of the past and present, maybe more a true mirror of his own personality, less zen purity and more Rock n Roll is how I might think about it. The 2014 Rebel Rebel has ripe fruit, lots of spice, earth and racy texture with intriguing lush layers and amaro notes along with a flamboyant core of deep red cherry, plum and wild raspberry fruits, plus cinnamon/exotic spice, dried flowers, loamy/stony elements and a touch of sweet oak. 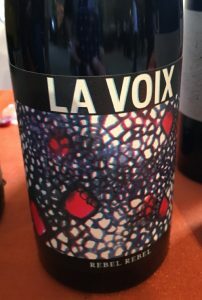 Made using native yeasts, in open-top fermenters with an extended maceration with about 10% whole cluster, then aged for a year in French wood with only about 10% new, the La Voix is a highly attractive Pinot Noir that was crafted from selected clones 50% each 115 and 777, modern Dijon, that give this wine it’s dark color and vibrancy as well as it’s rich mouth feel and impressive length. I’ve always admired the Brewer-Clifton wines over the years, as well as Steve’s own efforts with Palmina, and it’s great to see his rocking it into the future with these La Voix offerings, drink the Rebel Rebel Pinot over the next 5 to 7 years. 2015 Rhys, Pinot Noir, Anderson Valley. The new Rhys Anderson Valley 2015 Pinot is a dark and lively young wine that shows the vintage’s concentration and impressive mouth feel, but with nice cool climate vibrancy and definition, this is an exceptional wine for the price, though you’ll need to get on their mailing list to get this one, otherwise look for it on restaurant lists. I was thrilled with the latest set of Rhys releases, I was in particularly drawn to their new wines from Anderson Valley, with this cuvee being a standout and an excellent starting point to get into their style, but I also must say that each Rhys wine showed fantastically well, other highlights were the single vineyard Bearwallow Vineyard, Anderson Valley 2013, their home or signature Alpine Vineyard, Santa Cruz Mountains 2013 and the Horseshoe Vineyard, Santa Cruz Mountains 2012. Rhys in recent years has become a top Pinot house in California with a fanatical fan base that beg, cheat and steal to get these wines, they are darkly rich, textured and lengthy wine that show luxurious and lavish layers, Rhys is in the same league as Pisoni, Seasmoke, Pahlmeyer’s Wayerer, Littorai, Rochioli and Peter Michael. Why I picked the entry level Anderson Valley to focus on? Well, I seriously enjoyed it just as much as the top end stuff and though it’s youthful charm and energy gave it an exciting edge and it was a touch brighter and more floral in it’s delivery with vivid pure fruit and less chewy, sometimes a touch less is more, and that was my opinion, even though the single vineyard wines will most certainly live up to their famed potential, and I must note that 2013 is a vintage that needs time to show their best, if you have them be patient! 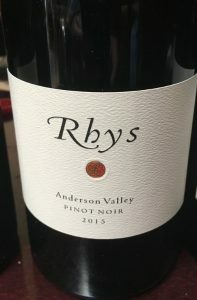 The 2015 Rhys Anderson Valley Pinot starts with a mix of red and blue fruits, earthy spice and lovely rose petal notes that leads to a fine palate of medium weight and gorgeous mouth feel with a core of black cherry, wild berries, racy currants and plum fruits as well as a hint of smoke, blood orange, tea spices, vanilla/cinnamon and brambly herbs. In the glass this is as Pinot as it gets with vigorous detail and lingers with a mix of blueberry and strawberry leaving a pretty fruit and mineral impression on the finish, it’s a wine that can be enjoyed right away and in the future, drink from 2018 to 2026. 2013 Mail Road, Pinot Noir, Mt. Carmel Vineyard “Blocks 3, 5” Sta. Rita Hills. As winemaker at Screaming Eagle’s sister winery Jonata and making the Hilt wines Matt Dees has made a name for himself and his new Mail Road wines are gorgeous, especially the Mt. 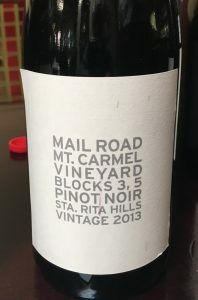 Carmel Pinots and in particular this 2013 Mail Road Mt. Carmel Vineyard Blocks 3 & 5 Pinot Noir, which comes from organic, own-rooted, heritage clone site in Sta. Rita Hills made famous by Greg Brewer and Steve Clifton at Brewer-Clifton in the late 1990’s and later by Raj Parr and Sashi Moorman at Sandhi Wines. Mail Road is a project owned by Mt. Carmel owner Ronald Piazza and Michael Palmer who brought in the ex-Staglin trained man Dees to craft small lots of ultra premium Chardonnay and Pinot Noir from this Cru, and after tasting the wines I am sure these will be highly sought after wines, these are not cheap wines certainly, but they show a remarkable sense of purity and inner energy that remind me of the early Brewer-Clifton classics from this amazing vineyard with glorious detail and class. Interesting Matt Dees, known as a naturalist or non conformist in his winemaking style, took a more modern Burgundy route with his set of Mail Road wines and this Mail Road Blocks 3 & 5 Pinot was 100% de-stemmed, cool fermented with seems like native yeasts and aged in French oak, with about 40% new, for almost year in the barrel. I must say the oak is well integrated and even subtle with just a hint of toastiness and vanilla sweetness in the background, you get elegant layers of silken red fruits, spice and floral tones that impresses for texture and length in a medium bodied Pinot. With air the wine gains weight, presence and intrigue, this stuff is stunning when unwound in the glass, showing a darker and more dense side, but still vibrant and focused with black cherry, plum and dark berry fruits along with hints of coco, violets, rose liqueur, mineral notes and chalky and dusty elements, finishing with lovely saline, light anise, tangy and vibrant red peach/currant/strawberry. A cut of acidity helps lift this wine and it’s refined/satin tannins providing a solid core that leads me to believe this Mail Road Blocks 3 & 5 Pinot will age with potential to improve even further, this can be considered an outstanding wine to cherish over the next decade, it delivers the Wow factor! 2015 Stolpman Vineyards, La Cuadrilla, Ballard Canyon. Stolpman Vineyard’s vineyard manager Ruben Solorzano and vineyard crew selected the individual vines for this red blend of mostly Syrah 68% with 20% Grenache and 12% Sangiovese in the 2015 vintage, it changes with each season/year, the La Cuadrilla is a special wine of high quality and value with the profits going to Stolpman’s full time vineyard workers. The winemaking is classic old world in style, the grapes are fermented with native yeasts in concrete vats and aged in neutral cask resulting in a deeply flavored wine with great fruit intensity, spice and pure harmony, in particular this 2015 is a very serious offering showing the vintage’s concentration from smaller than normal yields which adds to the depth and rich mouth feel. Layers of blueberry, boysenberry, currant and plum fruits lead the way along with crushed violets, framboise, peppery notes and subtle earthy/savory tones, this 2015 La Cuadrilla opens beautifully on the palate with unique intrigue and graceful texture, it’s more round and less edgy than prior releases, though still energetic and entertaining throughout, lingering on and on with velvety tannins, juicy/freshness and an aftertaste burst of cherry, sweet tobacco, lavender and a mineral element. The lush density is quite alluring and forward, but this La Cuadrilla, that comes in 13.9%, is finely balanced, it should drink with aplomb for many years, it’s one a California’s best kept secrets and a fun wine to enjoy in the near future. I love this stuff, bravo Stolpman! 2012 Jaffurs, Syrah, Santa Barbara County. I’ve long been a fan of Craig Jaffurs and especially his Syrah wines, so it was wonderful to taste his wine again on a recent trip to Santa Barbara, he and partner winemaker Dan Green are crafting small lot wines, mostly Rhone varietals, though they do make a fantastic Petite Sirah and a lovely Pinot Noir as well. The 2012 Santa Barbara Syrah came from six selected sites, Tierra Alta, Ballard Canyon, Verna’s, Los Alamos, Thompson, Los Alamos, Larner, Ballard Canyon, Bien Nacido, Santa Maria and Kimsey, Ballard Canyon with some Petite Sirah, Mourvedre, Grenache and a touch Viognier in the blend, which all add up to a fascinating and complex Syrah that delivers a full bodied and textured mouth feel and deep flavors. This Jaffurs Santa Barbara County Syrah was de-stemmed, but fermented in whole berry form and aged in used barrels, both French and America wood was used, it’s a dark wine with a brilliant garnet/purple hue in the glass with a cascade of black/blue/red fruits on the palate including damson plum, boysenberry, sweet cherries and racy currant/blueberry as well as hints of perfumy violets, smoky/embers, minty anise and white pepper. The extra few years of age have really allowed the tannins to melt in the mouth with a silken feel, while still holding everything together nicely, the balance for such a bigger style wine is impressive, at 14.5% it’s quite bold and rich with serious presence, it’s a wine that punches way above it’s price and shows expressive length and detail, length and hedonistic charm. Interesting exotic spice, lavender oil, creme de cassis, a trace of tapenade, kirsch and earthy/game make for an intriguing background and the lingering finish on this pretty and stylish Syrah, it was awesome with food, especially my porcini and duck ravioli! 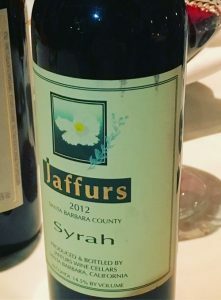 Tasted from half bottle, this 2012 Jaffurs Syrah Santa Barbara County should continue to provide heady and polished drinking pleasure for years to come, though it’s in a sublime place even right now, best from 2017 to 2024, it’s a class act in the bottle. 2016 Silvestri, Rose of Pinot Noir, Carmel Valley Estate, Monterey County. 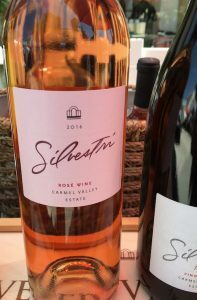 A new release from famous academy award winning music composer Alan Silvestri’s Carmel Valley estate winery, the 2016 Silvestri Estate Rose is a bright and fresh pink with a fine depth of flavor, nice mineral tones and crisp dryness. This succulent Rose offers brisk driving energy, but with a solid Pinot fruit core of sour cherry, mixed citrus, juicy watermelon, a hint of blueberry and distilled strawberry along with chalky stones, a light dusting of spices, rosewater and a touch of tangy minty herbs. The Big Sur Fire sent smoke all through Carmel Valley and caused some vineyards a total loss of crop with only a very few grapes not effected, luckily Silvestri survived the worst, and this lightly macerated Rose of Pinot Noir is free of any trace of smoke taint. Silvestri estate’s current set of wines are all top notch with their Syrah, Pinot Noir and Barbera 2014’s really standing out for style and quality, but I always love the Rose, it’s a local favorite and sells out fast, it’s only available through their wine list or through the Silvestri tasting room on 7th Street in downtown Carmel by the Sea. 2015 Samsara, Grenache, Santa Barbara County. Chad Melville’s Samsara 2015 Santa Barbara County Grenache is a bright, fresh and pure in varietal character and has a very natural feel and intensity, it’s absolutely delicious with fruit, earth and spice. This 2015 Grenache joins a lovely set of Syrah, single vineyard Grenache and Pinots made by winemaker Chad Melville, who also is the director of winemaking and general manager of Melville Winery in the Sta. Rita Hills, his family’s pioneering estate that has become one of California’s great family run properties. His Samsara wines differ in that they are much more limited and are true reflections of his own style, made with native yeasts, partial whole cluster and very minimal intervention from grapes grown to his belief in organic/sustainable principles. 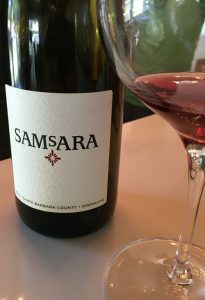 On a recent visit to the Samsara tasting room in Los Olivos, I enjoyed a sampling of the current releases, which include extended aged Syrah from Turner Vineyard, a long lees aged Rose of Grenache that is so good it reminds me of Clos Cibonne Cotes de Provence Rose, as well as this new 2015 Grenache that really needed to be in my collection! The 2015 Santa Barbara County Grenache Noir starts with delicate floral notes, wild spices, mineral and racy red fruits with a vibrant medium bodied palate of loganberry, plum, pomegranate and tangy strawberry fruits along with dusty peppercorns, cinnamon stick, cedar, framboise, lavender, briar and minty/salted black licorice. I really like it’s youthful zesty freshness, it is a thrilling Grenache that can be enjoyed right now with soft ripe tannins allowing it’s charm to shine through, and I suggest drinking this beauty from 2018 to 2024. Grenache is on a roll these days, especially in California with many tiny producers specializing in this grape, but it is seeing renewed attention in places like Spain, Sardinia (Cannonau) as well as in the Rhone and Languedoc regions of France, so it’s a great time to explore Grenache! 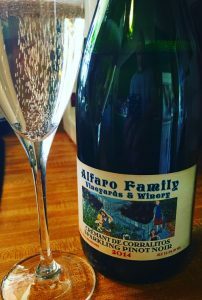 2014 Alfaro Family Vineyards, Cremant de Corralitos Pinot Noir Brut Sparkling Wine, Santa Cruz Mountains. The vintage grower fizz from Richard Alfaro’s Alfaro Family Vineyards is a racy and stylish Methode Champenoise bubbly made from estate Pinot Noir vines that really delivers stunning detail and complexity, you’ll want this stuff no doubt. This food friendly sparkler has great intensity and vivid flavors that reminds me of Paul Bara Champagne or Gaston Chiquet Special Club bottlings, it is especially divine with smoked salmon, poached white fish and lighter cuisine, though it’s dry/brisk focus can cut through lots of substance. The bright nature is dynamic and fresh giving a lean and lythe feel, but air allows good palate expansion and opens to pure mineral infused layers with lemon, green apple, white cherry, strawberry and peach fruits along with hints of spice, stones, dried golden fig, loam, rose petal and brioche. Alfaro said he wanted more of a refreshing/youthful sparkling wine like you get with a top Cremant d’ Alsace, and that was achieved clearly and with dry vibrancy, it’s less leesy than most Champagne(s), but gains richness in the glass in elegant fashion and is an impressive effort. This very limited release joins some very expressive California Methode Champenoise sparkling wines that are crafted in grower producer character that deserves praise and attention, this is a luxurious and intriguing vintage Brut, get it while you can. 2016 Big Sur Vineyards, Rose, Arroyo Seco, Monterey County. One of Carmel Valley’s recent additions, Big Sur Vineyards is a boutique family owned label with a fun and quality set of wines that are charming and fairly priced, Lenora Carey, the owner, has enlisted winemaker at I. Brand Family Winery Ryan Kobza to craft her wines, which helps show the pedigree and style. Carey suffered a huge loss last year, just as she got the tasting room open in the Carmel Valley Village, her property and small vineyard in Big Sur was destroyed by the raging fires that devastated region, though she has now got started on re-planting, and there is a lot of excitement for when those vines when they come of age in a few years. Of the current set there are a few real stand outs, Big Sur Vineyards BSV Red a Cal-Rhone cuvee of Grenache, Syrah & Petite Sirah, a gorgeous crisply dry Viognier and this seriously delectable Rose of Grenache & Cinsault, all which are attractive wines that offer value and reflects the varied terroirs of Monterey County. 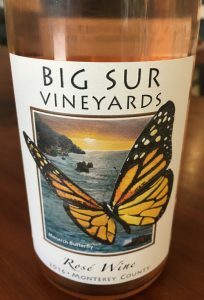 The 2016 Big Sur Vineyards Rose of Grenache and Cinsault comes from the rocky loam and ancient seabed soils of Arroyo Seco that adds to the dry brisk nature of this Southern France style pink that is dusty/crisp with stony/mineral tones showing a delicately pale hue and lean/bright citrus laced fruit character with grapefruit, tart cherry, strawberry, watermelon, rosewater and snappy/bitter provencal herbs. This is a wonderfully refreshing Rose that opens to a wet rock/shale and spice, but with a succulent openness, this is very Summer friendly wine to drink over the next year. Big Sur Vineyards is an under the radar winery making some solid small production stuff, check them out.